by focusing on a few key areas of your website and content. If you have already hired someone to show you how to seo or provide seo services and you are not happy with the results, then you need to learn more about what you need from them to ensure you are not being ripped off. If you aren’t getting more traffic it could be the results they are showing you are true seo results, not by any fault of their own usually, just because they don’t necessarily know all the tricks. I will show you those tricks, what to look for so you know if you are paying for the right service, and so you can do it yourself if you need to. Contact me today to request a one-one-one consultation over the phone, skype, email or in person. I am located in Brisbane, Australia. For $200 (through paypal) I will ask you a series of questions and then answer your questions and give you some top tricks for ensuring you know you are getting what you pay for in seo advice and teach you how to seo yourself. You know I know something about this right, because I have a number of sites on the 1st page of Google results. One of my sites was up there on the 1st day of submitting it. For local business I can do so much to help you find your customers that are looking for your products/services. 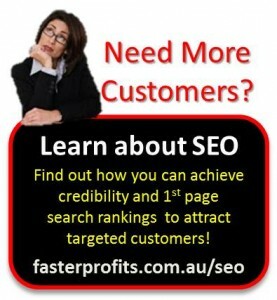 Contact me today and get started on skyrocketing your sales through seo advice. PS. I can also do it for you for $1,000 monthly retainer payable when you start seeing the results, minimum 6 month contract.